One Week in Portugal: A Complete Portugal Itinerary – The Discoveries Of. I’ve become obsessed with Portugal in the past few years, clocking up five trips last year alone. It can be difficult to plan a visit to a new country, so I’ve created this step-by-step Portugal itinerary with everything you need to know to plan the perfect trip. So you’re travelling to Portugal and are looking for the perfect Portugal itinerary? 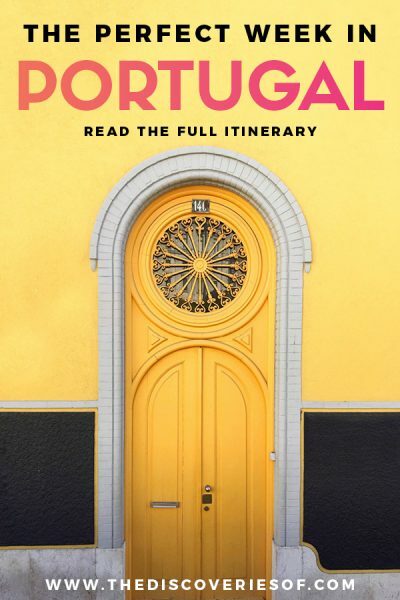 This one week in Portugal destination guide will help you plan your getaway: complete with a day-by-day itinerary of places to see, things to do and where to stay for each destination. Don’t get me started talking about Portugal. Each trip I’ve taken (nine, but who’s counting) to this striking country has made me appreciate it just that little bit more. It might be small, but Portugal is both fiercely proud and boasts a unique culture that is guaranteed to have you coming back for more. So much so that it’s a running joke with my buddies that if I ever disappear off the radar, Portugal will be the first place that they look. What’s so special about it? The history for starters. Portugal played a huge role in the Age of the Discoveries, during which European nations went to the New World in search of conquests, riches and produce. There are so many traces of this seafaring heritage today – from the elaborate architecture in Lisbon to the hearty, flavourful cuisine. Anyway. Enough of all that. 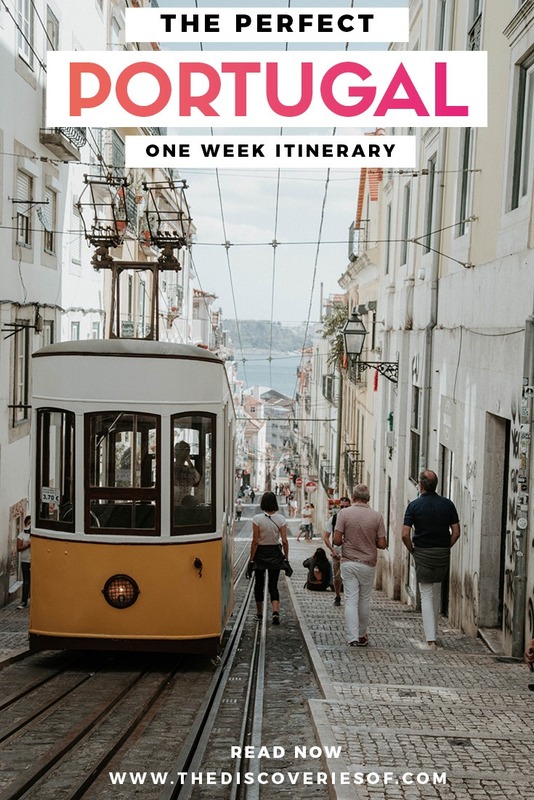 Let’s get to it: the ultimate one week Portugal itinerary. Portugal is a long and skinny country so it makes sense to start at the top and work your way down to the bottom during the trip. Beautiful Porto sits at the end of the Rio Douro, an enchanting maze of hilly streets, the houses and shops clustered around narrow walkways begging for you to get lost in. Lisbon may well be making a name for itself as one of the coolest destinations in Europe but Porto is should not be overlooked. 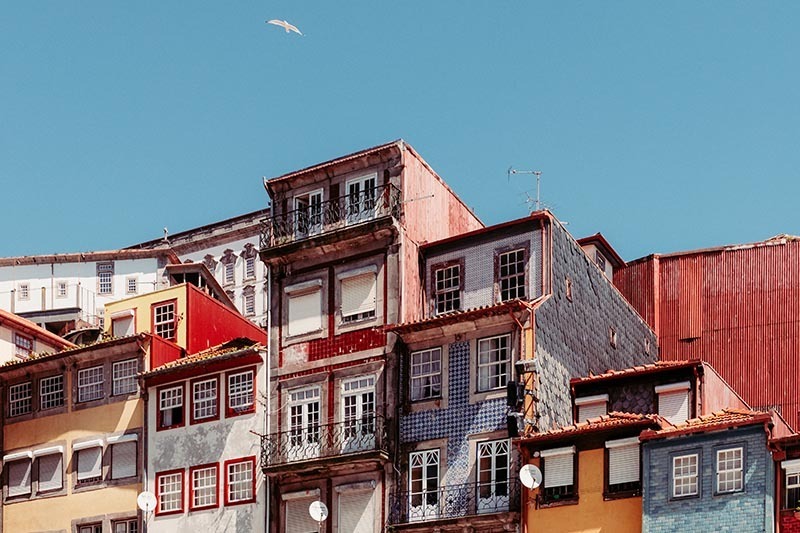 This eat the ffortlessly endearing city boasts a relatively quiet and easily walkable center, which includes the UNESCO heritage Ribeira District. Did you also know that Porto is one of the stops on the Camino Portugues? Fly into Porto’s Francisco Sa Carneiro Airport if you can, otherwise you can fly into Lisbon and take the train (the journey takes just under three hours). Alternatively you can book a private transfer from Lisbon airport to Porto, which takes around three hours. Check prices for Porto transfers. A luxury wine hotel in Gaia with stupendous views out over the Douro and central Porto. This is one of Porto’s best hotels and certainly one of its most stylish. The Yeatman is a personal favourite I’ve stayed in a few times and easily could stay in a few times more! Even if you can’t stay, splash out on a meal in their Michelin-starred restaurant. Check prices at The Yeatman. Not up for The Yeatman? Search for accommodation in Porto. Porto’s centre is easily walkable. Taking a few hours to walk around the city is the perfect start to your 7 days in Portugal. Meander through narrow lanes and twisting streets. Most of the city’s must-sees are within striking distance of each other. The UNESCO-listed Ribera district should be at the top of your list. Must-Sees: Clérigos Church and its iconic tower, Lello Bookstore (which is said to have inspired JK Rowling for Harry Potter), Cathedral Se, the old city walls, Sao Bento station (with its beautiful Portuguese azulejos tiles), the Dom Luis I bridge and opulent Igreja de Sao Francisco. I’m a sucker for learning about the history and culture of a destination so almost always book onto a guided tour when I arrive in a city. This one is highly recommended. You can’t visit Porto without paying homage to the city’s most famous export: port. There are several Port houses in Porto, mostly clustered in the Gaia area: take a guided tour and sample the tipples to learn about the fortified wine (you’re tasting for purely informational purposes of course). I’d recommend booking a Port wine tour, which visits two port houses, with tastings and food pairings at each. Check prices for the port tour. Check prices for the port tour. I’m a huge fan of famous Portuguese chef Rui Paula’s food. Paula’s high-end Portuguese restaurant is the place to treat yourself to a delicious meal out. Paula showcases the very best Portuguese ingredients in a minimalist setting. Book now. Part club, part concert venue, Hard Club is one of Porto’s coolest spots. Don’t arrive too early (before midnight) and prepare to stay until the early hours. Hop onto the tram line number 1 close to Praca do Infante Square. The old-school tram is the perfect way to see a different side of the city, it rattles its way through alongside the Douro river towards the coast, dropping you off into Foz do Douro. Once there, stop off at Casa de Pasto da Palmeira for petiscos (Portuguese small plates) at affordable prices. 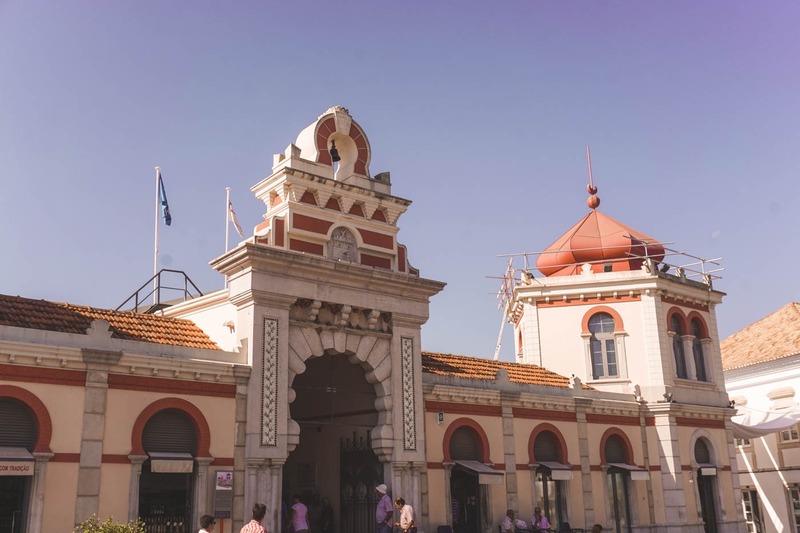 Step into history at the Mercado do Bolhao. 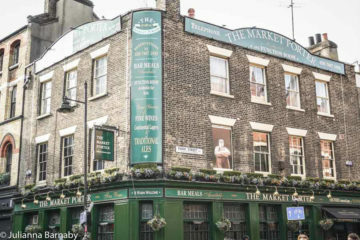 The market opened in 1914 and has been feeding the city within its rather spectacular walls ever since. Make room in your suitcase, you’re going to want to bring some of this food home. The crown of Porto’s music scene, the Casa de Musica is a striking piece of architecture, not to mention the location for an ever-changing rotation of DJ nights, concerts and more. Be sure to take a tour for the full immersive experience. The neighbourhood of Clerigos is brimming with bars and nightspots – join the throng for a few tipples at Baixa. The cocktails are divine. 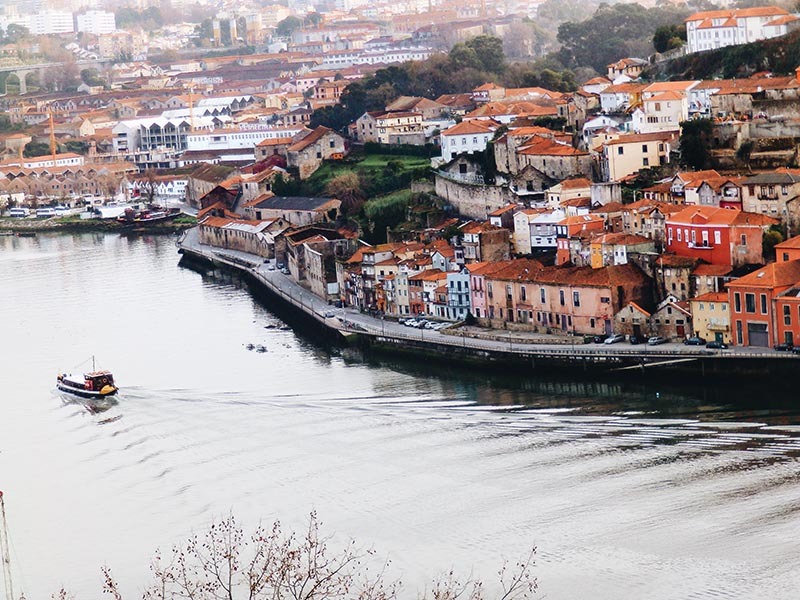 Don’t miss these top picks for Porto. 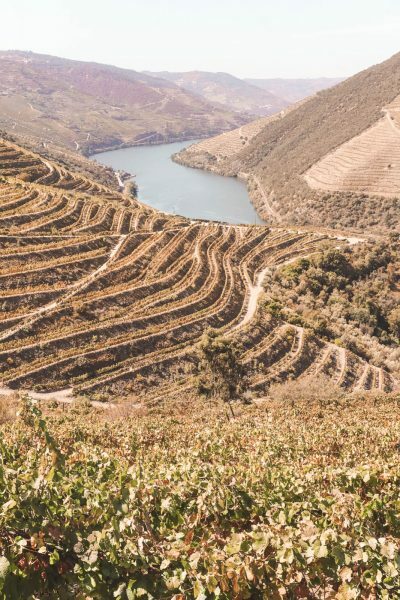 Take a trip into the Douro Valley to tour the vineyards. Producing the Port from which Porto takes its name, you can also take the opportunity to try the vineyards’ stellar wine. You can visit the Douro Valley on a day trip from Porto (this one is great) but it’s even better to spend a night in the valley. Bed down in luxury at the Six Senses, both the views and the rooms are divine. I cannot rave enough about the food at DOC. Chef Rui Paula turns out absolutely incredible contemporary Portuguese dishes in an idyllic setting on the banks of the Rio Douro. Don’t miss it. It’s time to move on to the next stop in your one week in Portugal itinerary. Our destination? Lisbon, Portugal’s beautiful and surprisingly laid back capital. I’ve visited Lisbon time and time again and it never fails to make me love it just that little bit more. Perhaps that’s why I’ve written so many articles about it, including this one on the best places to visit in Lisbon. 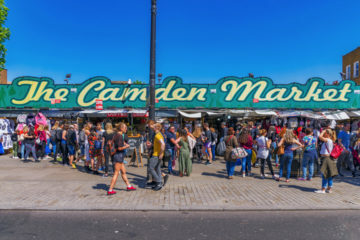 Relatively affordable, delicious food (wear stretchy pants) and a buzzing nightlife – it’s the cool kid that everyone can’t help but like. It’s also where you’re going to be spending the next three days, so settle in and enjoy the ride. Before you start, I’d recommend buying The Lisboa Card. It will save you a lot of money if you are planning on visiting quite a few attractions and includes public transport too. Pick yours up here. I’d recommend getting up and getting on with the journey from Porto to Lisbon as early as you can bear so you can make the most of your stay in Lisbon. You could fly from Porto to Lisbon but it’s a bit of a waste of time. You’re much better off booking a private transfer, going by train or, at a push, hiring a car and driving down yourself. If you do the latter, just remember that, like most cities, parking in Lisbon is not the easiest task. Trains and transfers take around three hours. I’ll be blunt. The Four Seasons is a treat. A very expensive treat. It’s my favourite hotel in Lisbon, but I have to admit that it comes at quite a steep cost. If you can afford it, you can look forward to decadent interiors (including marble bathrooms), eye-catching city views and a breakfast that’s to die for. There’s even a rooftop running track to help you burn it all off afterwards. Or search for alternative Lisbon accommodation. You know how I said that I liked to take a walking tour when I visited a new city. Scrap that. I took this vintage sidecar tour when I was in Lisbon and it was some of the most fun I had in the city. 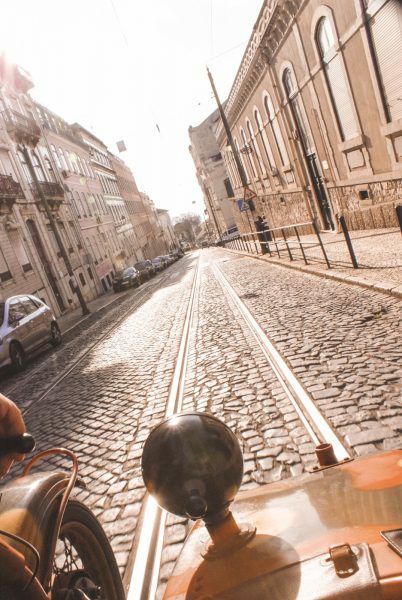 Who doesn’t love whizzing around the city tucked into the sidecar of a vintage motorbike with a cooler than cool Lisboeta dude telling you about all the secret spots, bags of history and taking you to the best panoramic points in the city. I’m not going to lie, I basically rave about this tour to anyone I know that is visiting Lisbon, and right now, that includes you . 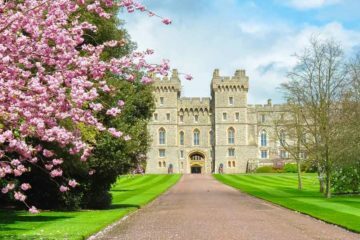 The tour is completely tailor-made, so if there’s stuff you’re not that interested in, are desperate to see, or have already seen, you can just let your guide know at the beginning of the trip. To be honest, some of the best bits of the tour where he took me to places I had no idea about before (I realise that sounds a bit 70 Mills & Boon lol). I’m still sworn to secrecy about a lovely local cafe that served THE BEST CAKES. Mmmn cake. Anyway, moving on. I’m guessing that you are going to be pretty hungry after your whirlwind tour of Lisboa, so do like the locals do and head to Cervejaria Ramiro for a traditional Portuguese seafood lunch. If you’re a seafood-lover (me! me! I love seafood), you are going to love your trip to Portugal. 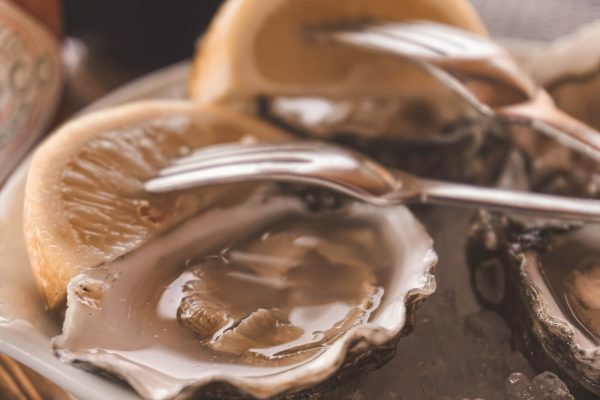 There are few European countries where the seafood plays such a huge role in the national cuisine. So why Cervejaria Ramiro? For one, the traditional setting couldn’t feel any more Portuguese – it’s filled with clusters, brisk waiters with a cheeky glint in their eye, but the seafood is the real star of the show. Lobster, langoustines, oysters, all freshly caught and simply prepared. Be prepared to queue during peak hours. Want to know more? Check out my review of Cervejaria Ramiro. 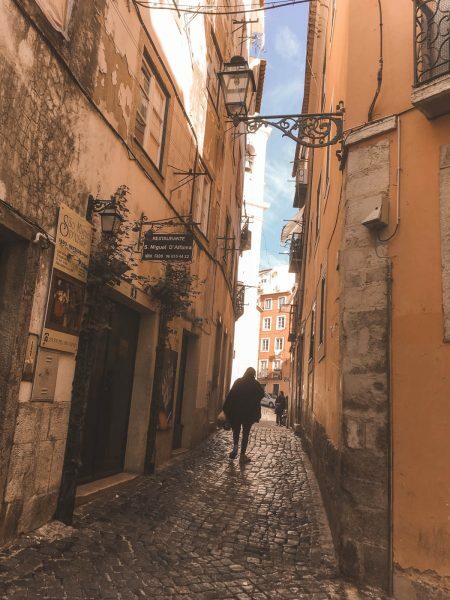 Head to Alfama in the afternoon, when the area’s narrow lanes and tall buildings catch the hues of the golden Lisboeta light. 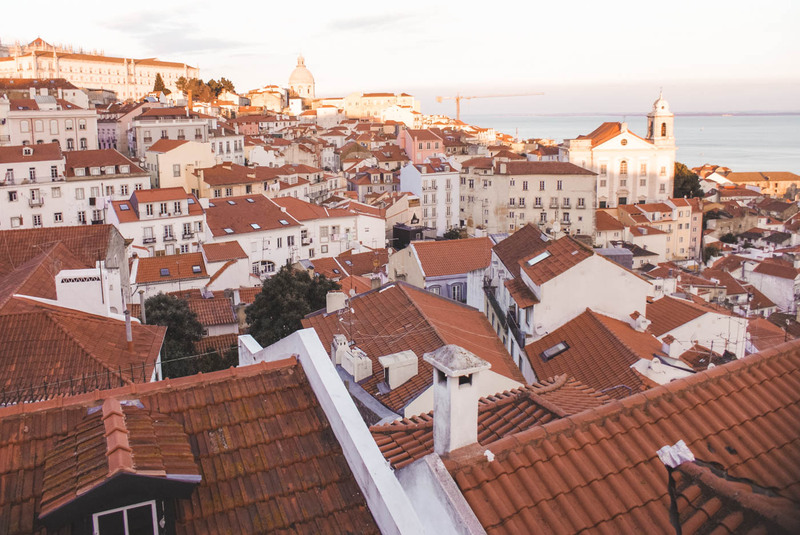 Alfama is one of the few areas of the city that wasn’t destroyed in the earthquake of 1755, so it’s a chance to see the Lisbon of a period that has been largely erased. If you can – go to the Portos dos Sol for sunset – the views of the city are pretty wow-worthy. 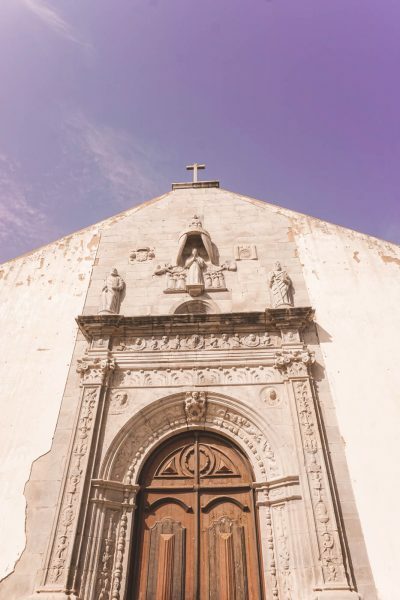 Other must-see spots in Alfama: Cathedral Se, Castelo de Sao Jorge. First up, fill up. We’re headed for Bairro Avillez. Chef Jose Avillez is another stellar Portuguese chef with a whopping seven restaurants dotted across the city (another has just opened as I’m writing this). How has one chef come to dominate Lisbon’s culinary scene? It’s simple, he makes banging dishes that make you happy to part with your cash and sad that your stomach isn’t actually a bottomless pit and at some point you’re going to have to stop eating the tasty, tasty food. 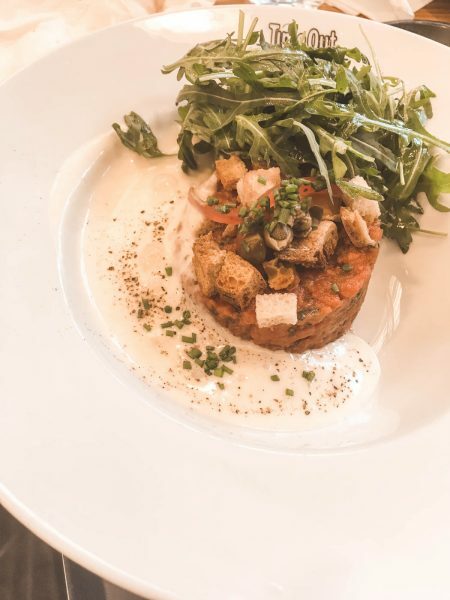 I received the tip to go to Bairro Avillez from the PR at the Four Seasons and believe me, that was a woman who knew every single restaurant in Lisbon and wasn’t afraid to be frank about her opinions on each (thanks Catarina). Now that you’re full. It’s time to go and see why Lisboetas have something of a reputation for partying hard. There’s no shortage of places to go and have a nice glass of wine, but if you’re serious about going all out, MusicBox is always popping. Nice as it is to spend all night ripping up the dancefloor, I have to admit big nights don’t appeal to me in the way they used to. Hot Clube de Portugal has a well-deserved reputation as one of the best jazz clubs in the world. I first visited as a (mildly pretentious) 17 year old and it’s still my evening destination of choice several (I mean several) years later. Sun drenched Belem is home to big-hitter after big-hitter. A few kilometres out of the centre, it’s the elaborate playground of times past. 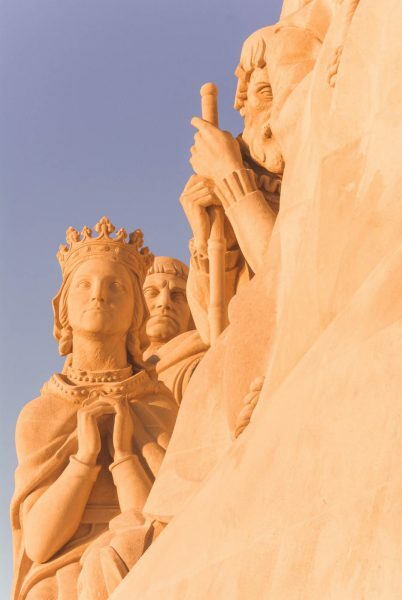 Few places have been shaped more by Portugal’s Age of the Discoveries – from the Gothic Manueline architectural fantasy of the Monastery of San Jeronimo to the stalwart Belem Tower and striking Monument to the Discoveries. Oh, and it’s the place to snap up the sweet, flaky and impossibly moreish pasteis de nata – they’re said to originate from the Pasteleria de Belem, where you can still buy them today. If, like me, you’re at least 50% driven by food, you are going to want to block out some time in your diary to visit. Queues to takeaway can be long – my insider’s tip is to go and sit inside, there’s often no wait time and you can be tucking into your pasteis in a matter of minutes. An old textile factory that’s turned into one of Lisbon’s biggest hipster hangouts? Sign us up. LX Factory is a cool conglomeration of indie businesses, including shops, restaurants and bars housed in industrial-chic quarters. It’s not that hard to see why this has become one of the city’s popular hangouts: the street art is off the hook and the food (yes, food again, it’s always food with me) is fab. There’s even a shop dedicated to cheesecake. 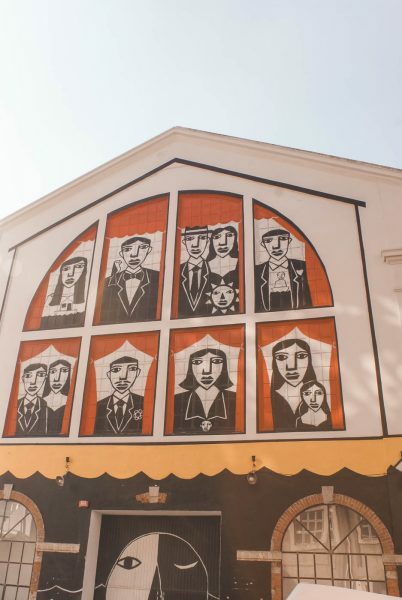 Lisbon is one of the big destinations on the street art scene, thanks to a roster of talented home-grown artists and lots of creative spaces for them to show off their skills. Hotspots include LX Factory (above), Calcada de Gloria, Rua das Gaviotas and Avenida Conselheiro Fernando de Sousa. Get ahead by downloading the Lisbon Street Art app (Android only) or book onto a street art tour. The international arbiters of urban culture and cool, Time Out opened their first market in Lisbon in 2014. Safe to say, it’s been drawing in the punters ever since. 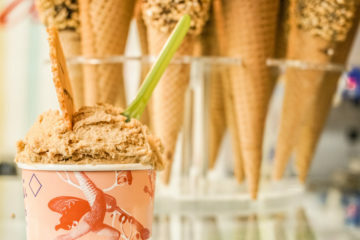 Many of Lisbon’s hottest restaurants and chefs have bagged a spot in the ever-changing rotation. I’m a total sucker for a well-curated food market. The chance to have a small plate from a few different restaurants is a great experience, particularly when I’m trying to see the best of Portugal in 7 days and have a limited number of meals in each city. My biggest tip? Go hungry and dine well. 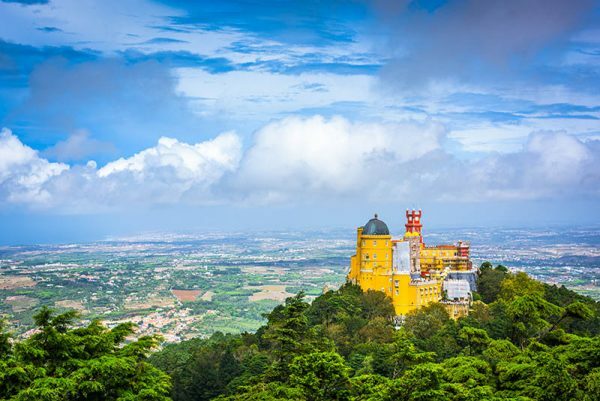 Travelling to UNESCO World Heritage Sintra is like stepping into the pages of a fairy tale. Brightly coloured palaces, exotic gardens and Moorish castles, you won’t regret making the trip. The trip from Lisbon to Sintra isn’t difficult – a simple matter of hopping on the train from Rossio or Oriente station in Lisbon for around 40 minutes. Tickets are cheap (less than €5) and trains are frequent. If you’d prefer to go on a tour, there are plenty of them – quite a few, like this one, take you to Cascais too. 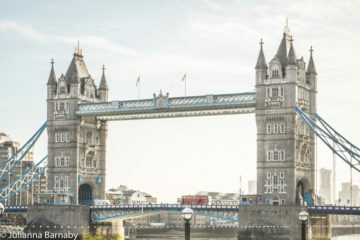 If you do book a tour, make sure that it covers all of the entrance and ticket fees – when they do, they’re a surprisingly cost efficient way to do the trip. Make a beeline for the Palacio Nacional, one of Sintra’s much-loved (and photographed) spots. A curious mix of architectural styles, it’s the kind of building you won’t find outside of Portugal – spacious courtyards, opulent decor and Insta opportunities galore. You can buy tickets on the day, book online (which gives you a 5% discount) or pay a little more to buy a skip the line ticket. If you’re doing this Portugal itinerary in the peak season, it’s well worth considering going for the skip the line option. The building that launched a thousand clicks – I was enamoured with the vibrant yellow exterior of the Pena Palace before I even clapped eyes on it in real life. Weird, wacky and all-out fabulous, the Pena Palace might look like an architectural romp, but in reality, it’s one of the most important expressions of the 19th century Romantic movement in Portugal. As with Sintra Palace, you can buy tickets on the day, book online or buy skip the line tickets. Just when you thought that Sintra couldn’t get any more dramatic… you come to the Castle of the Moors. Often shrouded in cloud, this striking castle is a 2km walk from Sintra-Vila. Buy tickets on the day, book online or buy skip the line tickets. Sun-soaked beaches with crystal clear waters and miles of Atlantic views, medieval towns and cities, fresher than you thought possible seafood washed with crisp whites from the neighbouring Alentejo. For many people, a week in Portugal starts and ends with a beach in The Algarve. And I can see why. It is really quite enticing to plop down and simply appreciate that good, good Portuguese sunshine. You’d be missing out though. Sure, the Algarve has spectacular beaches, but move away from these and you’ll discover a region with a vibrant culture and unique history that’s waiting to be explored. There are plenty of transport connections between Lisbon and The Algarve, but it will depend on where you stay. If, as I suggest, you stay in Lagos, you will need to get the train from Lisbon to Tunes (fast service) and then another slower service from Tunes to Lagos. Book ahead – tickets can (and will) sell out during the high season. Express buses run between Lisbon and Lagos, and take around the same time as the train. You can get around some parts of The Algarve without a car – particularly along the coast. Other destinations can be a bit more difficult. I’ve listed four of my favourite spots in The Algarve, and in all honesty, I haven’t attempted getting between them without a car. Seeing as you only have a couple of days left of your 7 days in Portugal, I’d suggest hiring a car – it just makes life much easier for this part of the country. I’ve only stayed in Vilamoura and Quinta do Lago during my trips to the Algarve, so can’t personally recommend a place to stay in Lagos. Casa Mãe is highly recommended and has a number of five-star reviews. If you are going to spend longer than a few days in the Algarve (a week or more), book a villa at the Four Seasons Fairways. Here’s a review of my stay. Looking for high-end luxe but with hotel amenities? The newly-opened Anantara Vilamoura is the perfect spot. Read my full review to find out more. 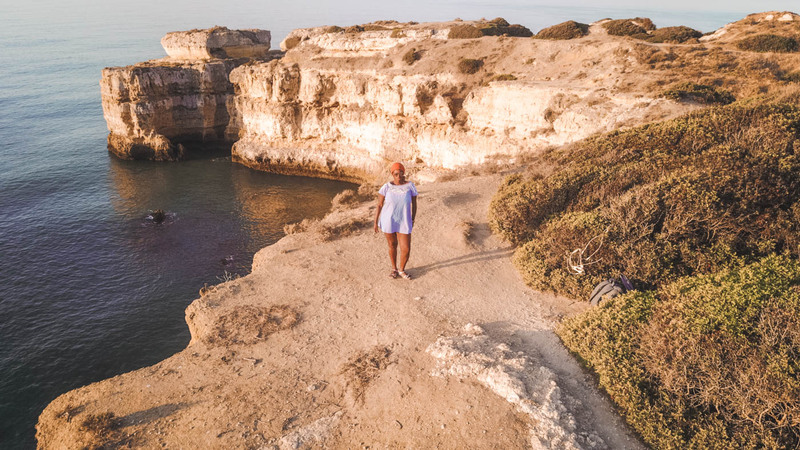 I’ve suggested that you stay in Lagos during your time in the Algarve – not only is it a rather charming destination in and of itself, it’s a good base to explore the rest of the region in the limited time that you have left. 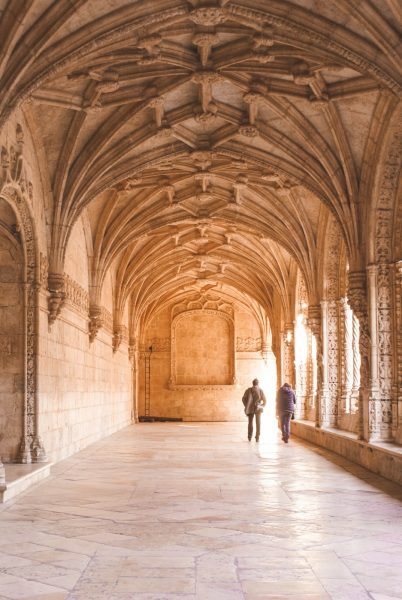 The centre of Lagos really isn’t very big – grab a map and walk to the baroque fantasy that is the Igreja de Santo Antonio. 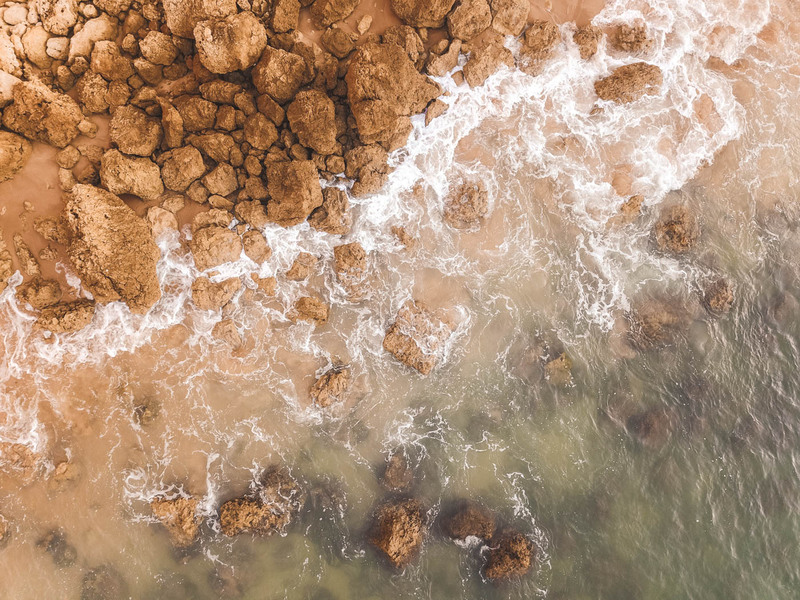 Nature has created many of Lagos’s biggest attractions: the rugged Ponta da Piedade comes complete with sandstone cliffs and nesting birdlife. Closer to town the Meia Praia is a good spot to try your hand at surfing, or simply sit back and enjoy the sun. Stop off in the quaint town of Loule in the morning to see it’s famous covered market in full swing. I’ve always stocked up on ingredients for the bbq during longer stays, but it’s worth popping in, if only to look at a traditional Portuguese market in action. The Benagil Cave is a short drive away from Loule and one of the area’s best natural sights. I personally think that Tavira would take the prize for the most picturesque town in The Algarve. With a church on practically every corner, castle ruins and a gorgeous setting on the Rio Gilao, not to mention numerous buildings with elaborate tiled facades, Tavira is just lovely. Once you’ve had a look around the city, strike out to the nearby Ilha de Tavira (only reachable by ferry). 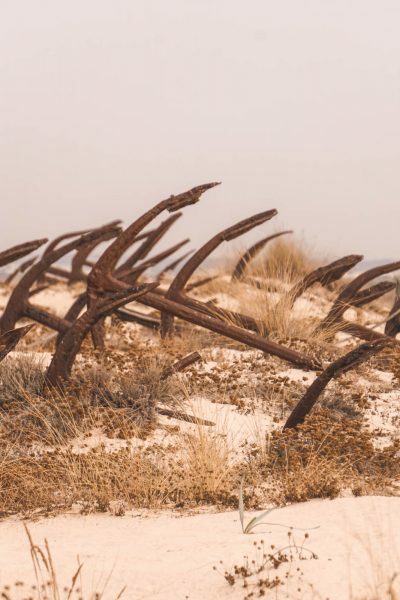 I loved the nearby Praia do Barril: a wild and rather windswept beach accessed by a short hop on a narrow-gauge railway and home to the quirky anchor cemetery. Yes, you read that right, anchor cemetery. In case you didn’t get the memo, Ilha Deserta means… deserted island. 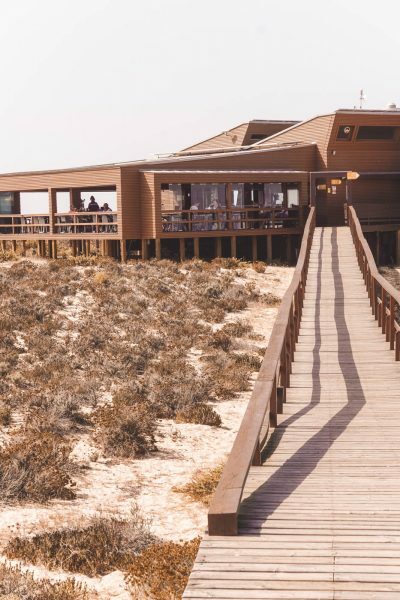 It might not be quite deserted, but this quiet island off the coast of Faro in the Rio Formosa Natural Park is the perfect place to escape the crowds residing on other of the Algarve’s heaving beaches. Take one of the informative eco boat tours over to the Ilha, they leave a few times a day from Faro’s harbour. Speedboats provide a noisier but more direct means of transport. The Ilha Deserta has another attraction though. Estamine Restaurant. This eco-friendly restaurant serves up astoundingly good meals with sea views. By now you know how much I love Portuguese food (and hopefully you will too) – if you trust me at all, trust me when I say you need to get yourself to this restaurant. Sunglasses: Portugal is no stranger to the sunshine, you’ll need them. Sunscreen: Again, see reference to copious lovely sunshine above. Universal travel adapter: Portugal uses the European two pin plug but I find having a universal travel adapter is much easier as you don’t have to buy a new adapter each time that you travel to a different country. these Dock & Bay ones – most microfiber towels are a bit ugly. Not these cuties. – you’re allowed to fly them in most parts of Portugal subject to some sensible restrictions. Interested? Read my travel drone reviews now. Comfortable shoes: Those super-cute cobbled streets might look #thatsdarling in your Instagram pictures but believe me when I say that they wreak havoc with your feet. Plus, with cities this walkable, it makes sense to do as much of it as you can. New Balance do great walking shoes. Mobile Phone Coverage: Pretty much everywhere. You can use your phone normally if you’re from the EU, otherwise you are better off buying a local sim card to use to avoid steep roaming fees. The main airports in Portugal are the Aeroporto de Lisboa in Lisbon the Aeroporto Francisco Sa Carneiro in Porto and Aeroporto de Faro in Faro. If you are travelling to the south Algarve, you can also fly into Seville in Spain and transfer from there, sometimes it’s cheaper. You have three main options when it comes to transport for your 7 days in Portugal: train, bus and car. There are benefits to each but I’d suggest taking trains and then hiring a car for the last two days in The Algarve. Driving in Portugal isn’t hard but I’ve noticed that sometimes drivers can be a bit aggressive on smaller roads. Just keep your own pace and let them do their thing. Drive on the right. And there we are, you’re all ready to set off. 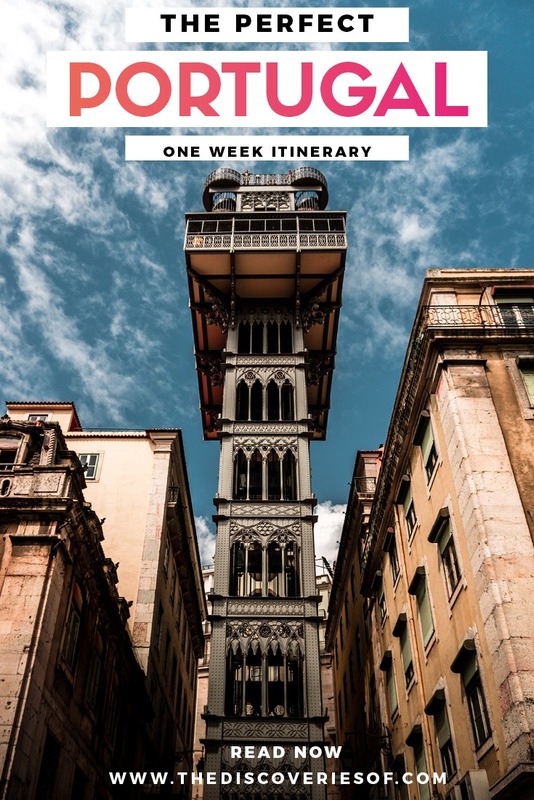 I hope you’ve enjoyed this itinerary and you’re ready to see the best of Portugal in 7 days. Got any feedback or suggestions? Drop me a message in the comments below. Found this guide useful? Save and share on Pinterest. This process has extra power if stated out loud. I will forever appreciate the amount of detail you have included in this post. The Estaminé and Bairro do Avillez recommendations got me drooling. Thank you for sharing your experiences, as they have definitely shaped my itinerary for Portugal this summer. All the best! Thanks Arina. 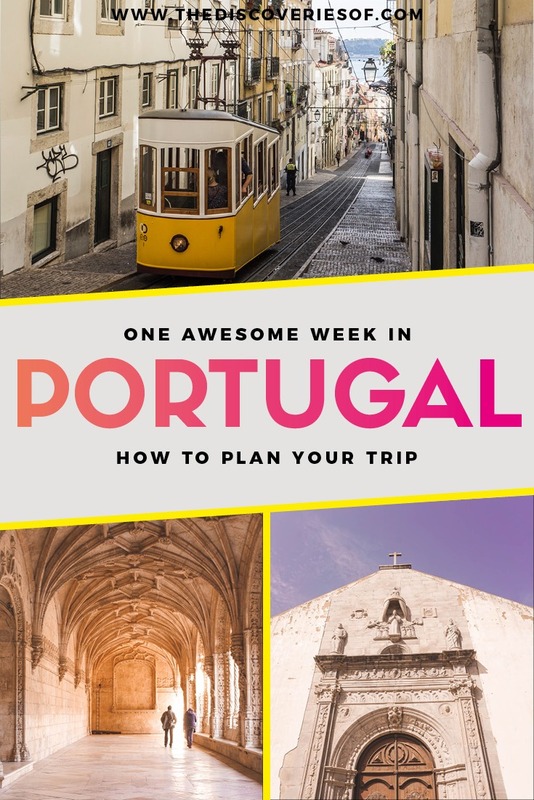 So glad that you found it useful and it gave you a few ideas for your time in Portugal – absolutely love the country and hope you have a wonderful time.